Autumn in Vermont, Green Valley. The evocative power of the mind to create, render, or envision that which cannot be sensed. Image, the derivation of the word. Today, it is important to distinguish how these words diverged in their precise implications today. Image, is the root of our word imagination. The imagination represents the conscious mental evocation of ideas, events, objects, representations, personalities, attributes, relations or processes which have not been experienced or perceived by the writer, artist or imaginative person. The imagination is used to create fictions or fantasies as a form of knowledge that are not necessarily the product of the senses which produce sensations. For Heraclitus knowledge was the product of sensations. In the Phaedo, Plato argues that sensorial knowledge is flawed contrasting doxa (opinion) with episteme (verity). Images are essential to understanding thought. images as representations of significant subjects. Herein lies the criticism of some that an uncritical attention to images verges on idolatry, or the worship of false idols. That criticism suggests that the image is less than the substance, because as the outward appearance of the form, it does not fully embody the depth of represented subject. In Michelangelo's famous portrait, on the ceiling of the Sistine Chapel, Adam's creation by God is represented by a divine touching of the human form. This is a richly imaginative, highly suggestive representation of the mingling of the eternal and immortal realm with the flawed and temporal realm where mortals strive, yet never attain their divine aspirations.No one would confuse their concept of God the creator deity with the figure above in this painting. The purpose of the artistic rendering was to reveal the hidden divine dimension in the otherwise carnal and mortal form of human flesh -- or to instill in humanity a deeper mystery of the deified presence in nature. In this sense art is symbolic, in that it carries a message that is separable from but connected to the representation displayed by the artist. The confusion of the symbol with reality is idolatry, and that is a sin to which we are all prone. Eide , was for Plato the underlying core of existence. In his perspective the visible universe is the eikon of the intelligible one that embraces Eide, and time is the image of eternity.Eide is the truly immutable, everlasting, the ground of real knowledge (episteme). Eidos (form) and episteme are locked together from their first implicit appearance in the Meno where true knowledge (episteme) does not come through the senses so we must be born with it. 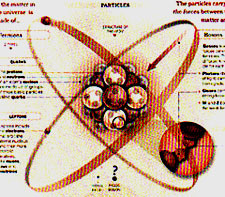 The representation of an atom by the New York Times is entitled the Nature of nature, meaning the character of the material world. Actually the image represents the unseen and universal character of atoms and quarks that today are believed to be the underlying building blocks of physical existence. While they are not immutable and are actually frozen out of the energy that delivered our world into being from a huge cosmic burst ridiculously hot plasma gasses, radiant energy and explosive power. Humans really can't sense atoms and only through electromagnetic experiments were these hidden entities understood. Atoms are so small that a sugar sized grain of sand is to a subatomic particle, like we are to the Earth. Subatomic particles, smaller than the atoms, are neutrons, protons and electrons that comprise the atomic elements from hydrogen to uranium and beyond. These are the closes conceptualizations we have to immutable substances, although, over a long duration of time, some atomic elements like radioactive elements decay into lead. Because images are designed to appeal to our sense, the body of knowledge associated with aesthetics is used to understand, judge and interpret the value inherent in symbolic representations. Compare for example, the meaning of aisqesis aisthesis, meaning perception, or sensation, today we derive the word aesthetics, or esthetic. .to explain the physiological processes involved in sensing an object.... Aisthesis found itself involved in the epistemological problems raised by Heraclitus & Parmenides. 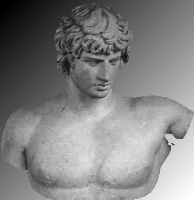 Aristotle associated aisthesis with philosophical questions and associated with the soul's sentient facets. Parmenides equated aisthesis with illusory knowledge & raised episteme up "as the only source of truth." 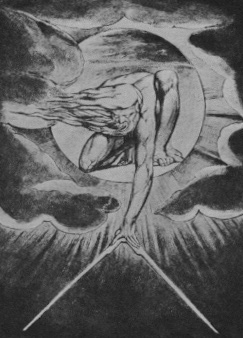 Empedocles, to the contrary, "took the senses seriously"
Consider this image --drawn by William Blake, in the 18th century-- of a very significant Greek idea, of the architectectonic inspiration for the way we sense the shapes, forms and context of the world. That creative impulse of nature is a concept embodied in the word demiurge, or demiouros - demiourgós, meaning the maker, or craftsman Meaning the soul of the universe & creator of the lesser gods. probably identified by Plato with the intelligent, efficient cause. But he is not omnipotent as he makes the kosmos as good "as possible" as he must cope with the counter effects of "necessity" (ananke). Continued to play a major role in later Platonism..., the demiurgic function is performed by a secondary emanation, by the Logos. The ethical dualism of the Gnostics appears in their making the demiourgós create the world without the knowledge of the eide.Eide, or eidolon, is the origin of our concept of idol, that is a sculpture of a divine, or at least transcendent presence. Image [Eikon, kon] is more related to the word icon, and the study of icons, or iconography. In 726 AD the Emperor Leo III of the Byzantine Empire created an ongoing controversy when he banned the veneration of religious images, calle icons. The movement, known as the iconolclasts, or iconoclastic heresy was comprised of those who desired the removal of all images of worship, as they embodied an idolatry where the believer fixated on the icon's image, or sculpted form, instead of revering what the object, painting or icon stood for -- the divine made manifest in mortal form. These elements were engendered by the dialectical combining together of heat, cold, wet & dry to form: water, earth, air and fire. Kepler, for many years, tried to apply the Platonic --so called regular-- solids to the structural interpretation of the apparent motion of the planets in the heavens. Not until he abandoned these images did Kepler look carefully at the recorded observations of Tycho Brahe to reveal the "geometry" of the heavens. In time lapsed photography the apparent motion of the planets is pictured above. F. E. Peters, Greek Philosophical Terms: A Historical Lexicon, (New York: NYU Press, 1967). Image is a means of unlocking the mental capacity for using symbols to convey meaning and significance.